All members of the church are welcome to attend parish council meetings to listen to issues about the parish. Meetings are held monthly. We encourage worshippers to become a registered member of the parish by completing a Membership Application and paying the annual fees. For first-time members, a special membership rate of $2 per person per year will be applied. All baptized individuals who actively confess the Orthodox Christian faith are members of the Orthodox Church. Individuals who register as members of our parish can participate in and vote at parish meetings, participate on the parish council, and benefit from special discounts on hall rental, special religious services and cemetery plots. Please provide your 2019 membership payment to our Membership Director, Inna Artyshchuk, or to our Treasurer, Olena Baran. Cash or cheque are accepted; please make your cheque payable to “Ukrainian Orthodox Church” noted with “2019 Membership”. For more information about becoming a member of our church please contact Fr. Ihor (613-728-0856 or 613-325-3903) or our Membership Director, Inna Artyshchuk (artinna@gmail.com). If you participate in our church’s Direct Deposit program, then you can arrange to have your membership fees paid from the funds you donate to our church through this program. Please contact the Church Office Administrator, Tatiana Zoubareva (613-728-0856), to leave a message for our Treasurer to contact you about this arrangement as well as about the Direct Deposit program. Just as most of us pay some or all of our bills by pre-authorized withdrawal, the church's Direct Deposit program allows you to donate to our church consistently and continuously throughout the year. You specify the amount to be withdrawn from your account at any financial institution, either monthly or bi-weekly,and that amount is directly transferred to the church's bank account at Buduchnist Credit Union. When you cannot attend church service, this program allows you to maintain your financial support of the church. This allows us to ensure our parish's overall financial stability to cover our operating expenses. Direct Deposit provides you with the convenience of not having to find the cash or write a chequeto put in the collection basket. Complete and sign the pre-authorized debit agreement (in the link on the right) and provide a void cheque. Once these documents are received by Buduchnist credit Union, then approximately 10 business days are needed to activate the arrangement. You can also arrange for your annual church membership fees to be paid using the donations you make through the Direct Deposit program. An income tax receipt is issued for all donations made through the Direct Deposit program. If you need assistance or further information, please contact Damian Snih at Buduchnist Credit Union in Ottawa at 613-722-7075. We prayerfully ask you to support our church through this program. 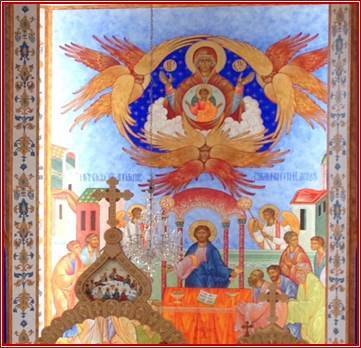 In 2012, the Parish Iconography Committee placed an advertisement in Visnyk (the official newspaper of the Ukrainian Orthodox Church of Canada) inviting iconographers to submit proposals for the design and painting of iconography for our church in Ottawa. They received proposals from several orthodox iconographers from across North America. The Parish Iconography Committee evaluated and selected the best three proposed designs which were presented at the March 2013 Parish Annual Meeting. The Committee recommended the highest ranked proposal prepared by iconographer Subdeacon Michael Kapeluck as the successful design. Following a discussion with the church membership, the Parish Council was given the approval to negotiate a contract for his services. The iconography project design provided us with an opportunity to showcase the Ukrainian Orthodox heritage in Canada's capital city. His design unifies the internal and external design elements of our church, highlighting the Biblical theme of the Tree of Life. His artwork portrays the history of our Salvation through the Saints and events of the Old and New Testaments. Our parish's ladies' organization, the Lesia Ukrainka Ottawa branch of the Ukrainian Women's Association of Canada, generously covered the cost of almost $81,000 for the creation and installation the iconography screens on the walls of the Altar. The iconography that adorns the walls of the Altar were installed in 2014 and 2015. This project continues with the iconography for the side walls of the Altar and the front walls of the Nave to be installed in early 2019. We pray that Our Lord God will assist us in this project and we are counting on your generosity to complete the iconography — to become a truly unique display of our faith and spirituality in our nation's capital. Just like our ancestors and forefathers, who worked together to build the churches in Ukraine and in Canada, we will work together and find ways to financially support the completion of this project in order to pass our legacy to the next generations. May God bless us in our work! 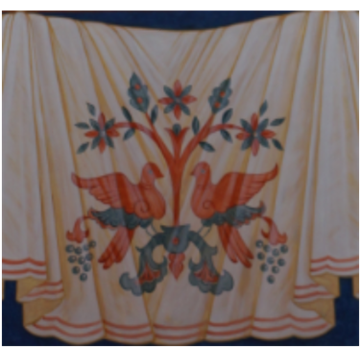 The iconography that adorns the walls in the Altar of our Cathedral consists of three distinct levels: the Platytera level, the Communion level and the Tablecloth level. The upper level of the main front wall, which faces the viewer directly, contains the Icon of the Theotokos (Virgin Mary, the Platytera in the Greek language) with her hands raised in a prayer position (orans in the Greek language). The image of Jesus as a child is depicted within a small round icon in the area of her heart. She symbolizes the link between heaven and earth through the Incarnation of her Son. In the upper section of the side walls, to the left and right of the Theotokos, are the twelve prophets – Zachary, Moses, Daniel, Jacob, Jeremiah, Solomon, David, Avakum, Gideon, Ezekiel, Isaiah and Aaron – who hold the objects and scrolls recalling their prophetic announcements of the Incarnation. Two ancient prophecies are depicted on the left wall – Moses before the burning bush and Jacob's vision of the ladder. The images of the twelve prophets are intertwined with floral elements. Iconography and scripture are rich with the images of vines and branches, with Christ being the vine and we, the faithful, being the branches. However, instead of the usual Byzantine style floral vines, the iconographer has used Ukrainian liturgical embroidery patterns. Additionally, Ukrainian, instead of Byzantine, patterns are painted on the long vertical edges of the back and side walls. The entire icon design is unique and fits comfortably within the icon tradition. On the Communion level of the main wall, below the icon of the Theotokos, is found the main icon of the Communion of the Apostles with Christ dispensing the Eucharist. This icon does not represent the Last Supper, which was an earthly event, but rather depicts a heavenly event. Christ standing at the Altar as high priest is eternally distributing himself to his apostles and to all of us. On either side of this icon, on the side walls, we see the four Fathers of our Church – St. Gregory of Rome and St. John Chrysostom on the left, St. Basil the Great and St. James of Jerusalem on the right – looking at the event transpiring between them. Through their writings, teachings and even martyrdoms they bear witness to the Faith and to He who is their Saviour. Here they stand as they stand in heaven, eternally bowed in worship and praise. On the lowest level on each of the three walls is an embroidered tablecloth, a decorative element. In actuality it is much more because it represents the Altar, our Father's table, at which we all sit. In the early church the entire congregation sat at tables. It was at these tables that the first seven deacons served. Eventually the common meal was separated from the Eucharistic meal, and the tablecloth pattern depicted on the lowest part of the walls is a reminder of that time. The colours were based on those traditionally used to depict the saints and images in the icons. The shade of the colours represents the unique palette of each iconographer. Red and orange-red, which represent humanity and life on earth, are commonly used for the clothing of Christ as a child and are also used on Christ's clothes in icons such as the Dormition, the Descent into Hades and the Ascension. Gold symbolizes divinity. Blue, signifying the heavens and the everlasting kingdom of God not on this earth, is the most common colour used for wall murals, particularly deep blues. The iconographer provided our Iconography Project Committee with several choices for the blue colour and they selected a lighter blue shade which then in turn informed the rest of his palette. In the Altar area, the colours take on an extra brightness due to the natural light coming through the rear side windows which illuminates the iconography. Much of the symbolism of the colours that are used in iconography has been lost over the centuries and the interpretation of colour has varied from century to century and culture to culture. For example, the colour red has been used differently over the course of history representing a variety of events and symbols, such as martyrdom, the fire of God or the Holy Spirit. 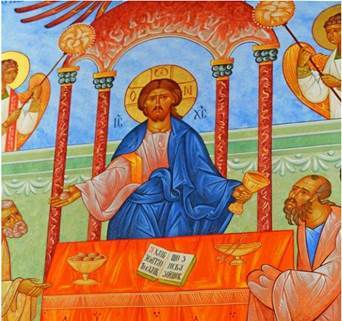 In more ancient times, the colour red, not the now commonly used gold, was used in the background of the Icon of Christ (Pantocrator in the Greek language) typically located in the largest or highest dome in a church. The colour palette used in our cathedral's iconography, while based in tradition, explores new uses of colour to speak to a new generation and culture. This exploration of colour and form is happening in churches all across North America and throughout the Orthodox world. Michael Kapeluck was selected by our Parish Iconography Committee to create the iconography for our cathedral. Born in 1963 in Pittsburgh, Pennsylvania (PA), Michael showed artistic ability early in life, which led him to study art at Carnegie Mellon University, earning his Bachelor of Fine Arts (with high honors). After several years of showing his artwork in area art galleries, Michael decided to move his artistic skills away from the world of secular art and to devote his life to the study and creation of the sacred art of iconography. He has been blessed to create icons for churches and individuals for 25 years and continues to enjoy the challenge of pushing his skills to greater levels. He thanks the Lord for the tremendous blessing of being able to have a sustained career in this sacred art form. He is a lifelong communicant of St. Peter & St. Paul Ukrainian Orthodox Church in Carnegie, PA, where he works and enjoys life with his wife, Michele, and their two children, Zachary and Mikaela.